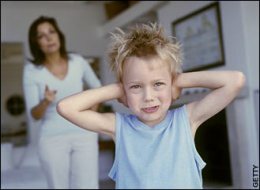 Child tantrum is a very common behavioral problem which is witnessed by every parent at one time or another. Temper tantrum usually occurs from age 1 to 4 years. Children demonstrate varied behavior patterns like crying, screaming, lying on the floor, kicking etc. It is seen that some children may throw regular tantrums while for other children the tantrums may be occasional. It is important to remember that throwing tantrums are a normal part of development and should not be seen as something negative. In the course of a typical tantrum, a child will cry, scream, and swing their arms and legs. In more severe cases, a child may hold their breath, kick, pinch and show aggressive behaviour. 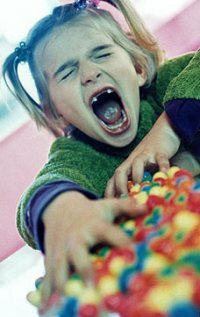 Violent tantrums like these in which the child harms himself and others, could be a sign of a more serious problem. But even tantrums which are violent are not necessarily a sign of something negative. Tantrums are common in both boys and girls. Tantrums must be dealt with properly at a young age itself or it may become a habit later on. 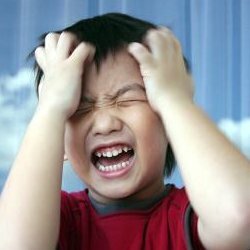 Temper tantrums are common among children under age 4. They are usually short lived. Temper tantrums are a problem when they continue. You have probably heard of the "Terrible Twos". Children around this age are learning to be independent from mommy and daddy. It is a major step from infancy to childhood. The "twos" do not have to be terrible. A temper tantrum is an emotional outburst or acting out and may include screaming, kicking, hitting, crying or holding his breath when the child does not get his way or desire. He is showing frustration. Since he is unable to fully express his frustration verbally and is not experienced enough with problem solving abilities, he throws a tantrum. Initial temper tantrums are normal childhood behavior; ongoing temper tantrums are a learned (inappropriate) behavior. 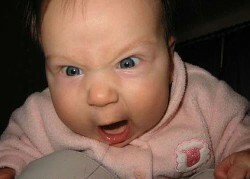 Temper tantrums are most common at the age of two as this is the time when the child is developing his language skill. Toddlers generally understand more than they can convey. When they are unable to express their need or feelings they start throwing tantrums. It has been seen that children throw temper tantrums when they are hungry, or feeling frustrated. At times children throw tantrums when they are feeling sleepy or they are very tired. The toddler may be uncomfortable physically or emotionally. There are chances that a wet diaper he is wearing is exasperating him or the social environment or a host of strangers around him is causing the discomfort which triggers the tantrum. Other causes of temper tantrums are when they are unable to communicate their need (for any object or parents attention) frustration leads to temper tantrums. Some children are more prone to develop temper tantrums compared to others. It is therefore important for the parents to understand the cause of the tantrum and manage it effectively. Infant temper tantrums are more common during the second year of life. A temper tantrum may last from 30 seconds to a couple of minutes and the intensity reduces as time passes. 1. Crying, screaming or shouting. 2. Arching the body backwards so as to tense the body. 3. Swinging the arms around in anger. 4. Breath holding spasms may occur along with temper tantrums, when the child may hold his breath for prolonged period of time. 5. In cases of severe temper tantrums the child may manifest symptoms like kicking or biting, hair pulling, throwing and breaking things, head banging to inflict injury, etc. Ignoring the tantrums and helping a young child learn how to deal with anger and frustration are often good ways to deal with tantrums. Pay attention to what starts the tantrums. Knowing what triggers the tantrums can help you act before your child's emotions get past the point where he or she can control them. Your descriptions. It may be helpful to keep a record of the temper tantrums for a few days before an office visit. A physical exam and medical history. Your child's doctor will examine your child and ask questions to help find out whether temper tantrums are part of normal growth and developmental patterns or if it's possible that other behavioral or medical causes are responsible. 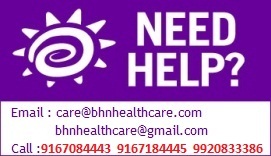 To eliminate other behavioral or emotional problems as the cause, the doctor may also ask you to complete a behavior assessment questionnaire. Sometimes the child's care provider or school teacher is asked to complete a similar form. Preteens and teens may be asked to complete a questionnaire about their perception of their own behaviors. The doctor can use the completed questionnaires to determine whether the child needs professional help and whether you need help dealing with the child's behavior. Your child comes home from school in a state. He or she is panic stricken. The reason? Take your pick. In today's chaotic world, he or she may be worried about anything and everything from natural disasters like Hurricane Katrina and global warming to terrorism and the Iraq War. So what's a concerned parent to do? If a doctor suspects that your child's temper tantrums are a sign of another disorder, he or she may order tests to check for other illnesses or conditions, such as seizures, learning problems, or attention deficit hyperactivity disorder (ADHD). Most children learn other ways to deal with their anger and other strong emotions as they grow older and do not need medical treatment for temper tantrums. Ignoring the tantrum behavior and helping a young child learn how to handle his or her feelings is most often all that is needed. Parenting workshops can be helpful for parents of a child who has temper tantrums. These types of programs often help parents become familiar with growth and developmental stages and provide strategies on how to handle difficult behavior. Have long-lasting and frequent temper tantrums. Regularly have temper tantrums after 4 years of age. Hurt themselves or become violent. You have concerns about your child's temper tantrums. Your child's temper tantrums frequently last longer than 15 minutes or occur more than 3 times a day. Your child's behavior does not improve after 4 years of age. Your child hurts himself or herself, other people, or objects during a temper tantrum. You have problems handling your child's behavior, especially if you are concerned that you might hurt your child.